Erdogan, under the so-called Turkish-type Presidential Regime, has infinite authority over the civil society as well as all branches of the state. Turkey’s new constitution let Erdogan to issue Presidential Decrees that have equal power with law. Presidential Decree No:5 of which name is Presidential Decree as to the State Inspection Institution (Devlet Denetleme Kurumu – DDK) regulates (article 1) that Turkish Presidency has authority to inspect Bar Associations, Professional Organizations, Trade Unions, Chambers of Commerce, Employer and Employee Unions, Association and Foundations. Moreover, any senior inspector (Grup Başkanı) of the D.D.K. would be able to suspend the chairperson, and the board members of the aforementioned entities should the inspector decides that it is necessary for the soundness of the inspection or the public weal (article 6). By the Decree No:5, Erdogan gets infinite authority over the Union of Turkish Bar Associations and provincial bars, Union of Turkish Doctors, and all other unions, chambers, unions, associations and foundations though it flagrantly violates article 135 of the Turkish Constitution. Hereafter, Turkish President has authority to unseat chairperson, and board members of those entities which are defined in the Constitution as professional organizations with public institution status incase of they call a strike, file a case against an administrative decision, document a torture incident and so on. In Turkey, Bar Associations and Union of Turkish Doctors play a vital role in preventing torture while Unions of Engineers have a vital role in protecting the environment and the work and worker safety. 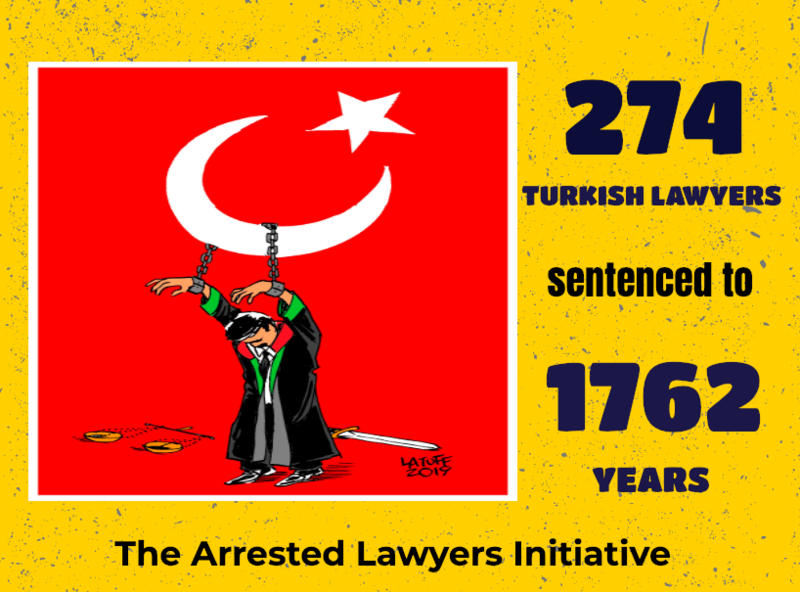 Since the coup attempt of 2016, there has been immense oppression by the Turkish government over the bar associations, law societies, unions and other elements of civil society. So far, fourteen incumbent or former presidents of the provincial bar associations were targeted by Turkish government. President of Konya Bar Association Fevzi Kayacan (sentenced to 10,5 years), President of Trabzon Bar Association Orhan Ongoz, President of Siirt Bar Association Cemal Acar, President of Gumushane Bar Association Ismail Tastan were arrested and then unseated. Former Presidents of Manisa, Erzurum, Erzincan, Afyon Bar Associations Zeynel Balkiz, Mehmet Guzel (sentenced to 13 years), Cemalettin Ozer, Mehmet Akalin were arrested too. In addition to all; presidents of the Aksaray and Kahramanmaras Bar Associations, Levent Bozkurt and Vahit Bagci and former presidents of Yozgat Bar Association Haci Ibis and Fahri Acikgoz were detained and then released. In June 2018, Turkish Interior Minister Süleyman Soylu claimed that all non-governmental organisations and Diyarbakır Bar associations in the country’s southeast are affiliated with the outlawed Kurdistan Workers’ Party (PKK), during an interview he gave to Turkey’s state-run TRT Haber. On 30th June 2018, Turkish police arrested senior members of the Turkish Medical Association, days after President Recep Tayyip Erdogan branded the group “terrorist lovers” for calling for a halt to Ankara’s military offensive in Syria. Eleven arrest warrants were issued for members of the doctors’ union, according to the state-run Anadolu news agency, with police searches launched across eight provinces.